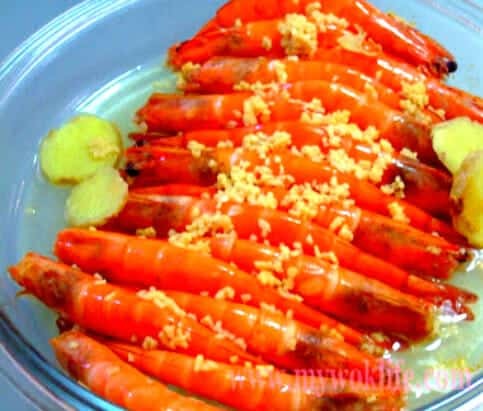 Steamed prawn or called it steamed shrimp, is a popular and common dish across all countries. Many of us know how to cook it. Each of us has our own unique ways to handle this dish to our best. I just wish to share my best way of making the steamed prawn dish. So, you are welcome to take my recipe as a reference (smiling). I like to cook all dishes with a wok. So, I turned my wok into a steamer instead of using an electric steamer. 1) Trim and wash the prawns. Arrange prawns presentably in a large porcelain, glass or stainless steel deep serving dish. Have all prawns fitted snugly in the serving dish. 2) Add seasoning. Swirl the seasoning around to coat the entire food surface in this sequence: sesame oil; rice wine; sugar; white pepper. 3) Sprinkle garlic evenly, and then place ginger slices on the prawns. 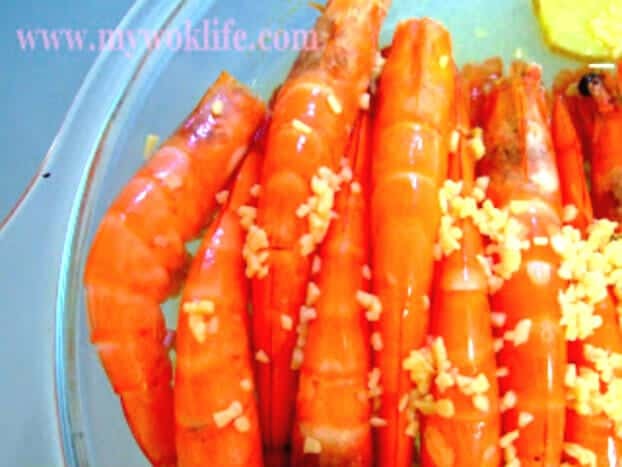 Marinate prawns for about 15 – 20 min. 4) Place steam rack (wire stand) inside the wok, and pour water in wok till the rack level. Bring water to a boil. Carefully place whole plate of prawns on the rack. 5) Cover wok tightly with lid. Steam prawn for 6 min, or until pinked. 6) Take lid off the wok, beware of dispersing steam heat when lid off. Remove prawn carefully from wok. Serve immediately. I sprinkled a little bit of sugar to cook this dish. Not to taste, the purpose for adding in sugar is to bring the natural taste of the prawn to its fullest. Sugar acts as flavour enhancer, in this case. This simple dish took me 30min (including marinating time) to have it served. Calorie-count of 4 cooked prawns less than 80kcal. That’s light, and yet, tasty. I said it’s a low-fat dish, you agree? Tips: Serves with cut ‘chili padi (Thai pepper)’ in light soy sauce as dipping sauce, it complements well with the steamed prawns. If chili padi taste too spicy for you, go with minced garlic in light say sauce instead. *Never remove plate of steamed prawns with bare hands. Use a kitchen utensil or with thick kitchen gloves. You got some great color on those prawns! Beautiful. I used white prawns instead of tiger prawn. I guess it contributes to the nice colour.